Who's Dissin' the Sweet Peas? I adore sweet peas (Lathyrus odoratus). My love affair began as a child, when I buried my nose into a bouquet of the highly scented flowers and breathed in their sweet fragrance. I don’t remember the vines growing in my family’s garden, but when I became an adult and cultivated my own, I grew them often. They are easy to grow in our mild maritime climate. The flowers come in an assortment of colors, and their aroma is divine. I assumed everybody loved them. So, when plantsman Christopher Lloyd (1921-2006) came to town on a lecture train, I was surprised when I heard him speak with disdain about my favorite, sweet-smelling annual. He’s dissin’ my little beauties, I thought, as I sat listening to him speak to an enthralled audience. He definitely was an opinionated man, who didn’t appear to hold back voicing any of them. I don’t remember why he disliked them. It’s possible I blocked out his reasons by silently chanting, "La la la, I can’t hear you," under my breath. 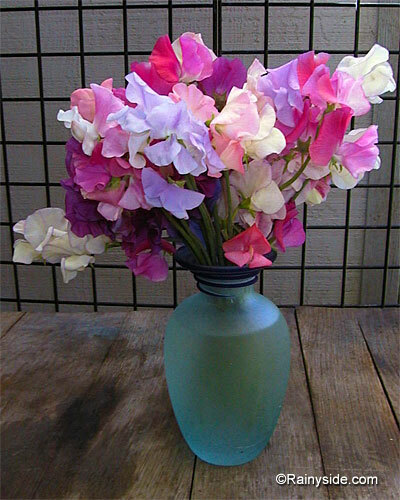 In England, where they have highly competitive contests growing exhibition quality sweet peas, perhaps they are grown as commonly as we grow pansies, petunias, and primroses. Later in Lloyd’s talk, he spoke fondly of the marigolds he grew in his gardens at Great Dexter. He doesn’t like sweet peas, but adores marigolds? They are at the bottom of the pile of plants I dislike; I regard them as nothing more than slug food with a funny odor. Looks like I am just as opinionated! I realize that just because I admire or respect a gardener, doesn’t mean I agree with all his/her opinions, or even like the same plants they tout as the best to grow. Besides, plants fall in and out of favor all the time. Like fashion, in one era they are everybody’s favorite, and plant breeders erupt into a hybridizing frenzy. In the next era they’ve fallen out of favor. We gardeners can be a fickle lot; nevertheless, I refuse to despise the sweet peas, no matter if they are fashionable or not. Now I grow selected hybrids, changing year to year as I strive to grow every single one that captures my fancy. Many of the exhibition quality cultivars have nice long stems that make them the best choices for cutting. Even though the flowers last only three days in a vase, they are worth it when their fresh, sweet scent fills a room. Obviously, with the great selection of seed available, I am not the only one who finds them irresistible.